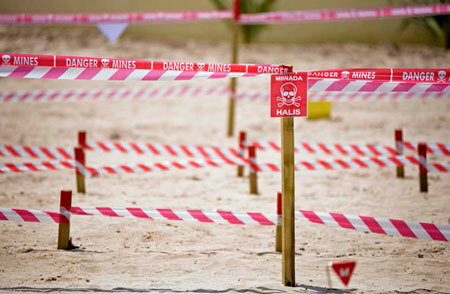 Landmines and other explosive remnants of war (ERW) plague more than 50 countries on every continent and continue to cause casualties to civilians even decades after conflict has ended. 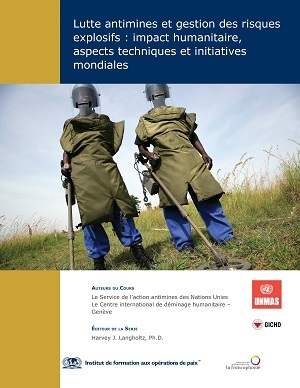 The United Nations Mine Action Service (UNMAS) and the Geneva International Centre for Humanitarian Demining (GICHD) have collaborated with POTI to develop and now update this course, which offers a comprehensive introduction to the policies, procedures, and standards that shape Mine Action activity around the world as countries and NGOs pursue the eradication of these hazards. The material seeks to empower students with the knowledge to champion the United Nations' vision of "a world free of the threat of mines and explosive remnants of war (ERW), including cluster munitions, where individuals and communities live in a safe environment conducive to development and where the human rights and the needs of mine and ERW victims are met and survivors are fully integrated as equal members of their societies." Topics include The Anti-Personnel Mine Ban Treaty (Ottawa MBT); mine action guidelines for ceasefires and peace agreements; landmine and ERW safety training; identifying landmines and ERW; International Mine Action Standards (IMAS) and guidelines for application; victim assistance; mine risk education; UNICEF mine action strategy; mine information; mine action assessment; and the electronic mine action network E-MINE. A new lesson addresses the concern of identifying and responding to Improvised Explosive Devices (IEDs). Eight lessons. Les mines terrestres et autres restes explosifs de guerre (REG) constituent un fléau dans plus de 50 pays sur chaque continent et continuent de faire des victimes civiles même des décennies après la fin du conflit. Le service de l’action antimines des Nations Unies (UNMAS) et le Centre international pour le déminage humanitaire - Genève (CIDHG) ont collaboré avec le POTI pour développer et maintenant mettre à jour ce cours, qui offre une introduction détaillée aux politiques, procédures et normes façonnant la lutte antimines autour du monde au fur et à mesure que les pays et les ONG poursuivent l’éradication de ces dangers. Les documents visent à armer les étudiants de connaissances afin de défendre la vision des Nations Unies d’un « monde libéré des menaces générées par les mines et les restes explosifs de guerre (REG), y compris les armes à sous-munitions, dans lequel les individus et les communautés vivent dans une environnement sûr propice au développement et dans lequel les droits de l’homme et les besoins des victimes des mines et REG sont pris en compte et où les survivants sont pleinement traités en égaux en tant que membres de leurs sociétés ». 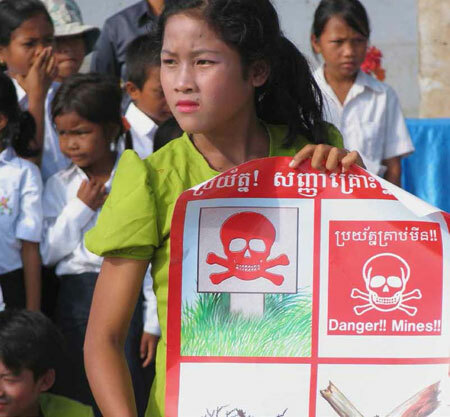 Les sujets incluent la Convention sur l’interdiction des mines antipersonnel (Convention d’Ottawa), les directives de lutte antimines pour les accords de cessez-le-feu et de paix, la formation sur la sécurité des mines et REG, les Normes internationales de lutte antimines (NILAM) et les directives pour l’application, l’assistance aux victimes, l’éducation au risque des mines, la stratégie pour la lutte contre les mines de l’UNICEF, l’informations sur les mines, l’évaluation de la lutte antimines et le réseau électronique de lutte antimines E-MINE. Une nouvelle leçon aborde l’identification et la réponse à adopter avec les Engins explosifs improvisés (EEI). Huit leçons. "the course was very informative ,educative and systematic"
"The course is very educative, most especially for peacekeepers serving in post war areas." "What i like about the course is the training system and availability of Course Materials. " "the course was very good, the pdf book is just so much comprehensive "
"The risk assessment procedures and education "
"Interesting to find this course online, may you keep on giving us many chances to find many courses online." " J’ai été particulièrement intéressée par l’ensemble du programme. Toutes les notions ont pu être abordées et largement étayées d’exemples concrets.et de supports. Mes objectifs ont tout à fait été atteints. Grâce à cette formation en ligne, je souhaite un jour, bénéficier d'une formation pratique afin de mettre mes compétences au profit de l'équipe du maintien de la PAIX dans le Monde. Evidemment je la recommanderai à des amis et connaissances. Sylvain N'GUETTIA./FHI360"
"The course is beyond expectation. The materials are arranged in simple and easy to understand. Highly recommended"
"it was really nice topic full of knowledge especially to those working and intending to work in mission area. thank you so much "
"THIS COURSE IS VERY HELPFUL,EDUCATIVE AND INSPIRING"
"I liked the practical examples given,scenarios and the deep explanations." 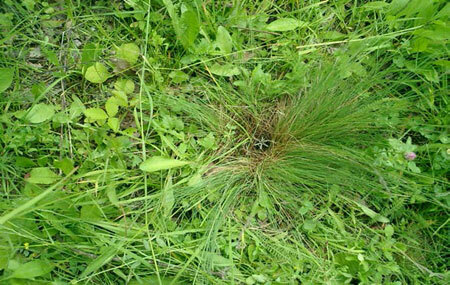 "The course gives good information about precautions with Landmines. 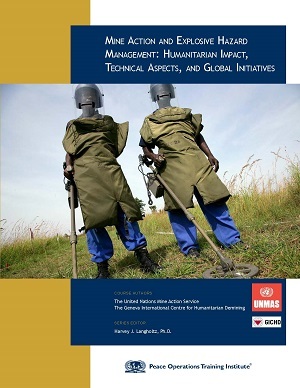 Preapres one on what to do when in such circumstances of landmines"
"What I like most in the Course, I've learned a lot in Mine Action and Explosive Hazard Management: Humanitarian Impact, Technical Aspects, and Global Initiatives. It is very important in the United Nations mission personnel who are about to be deployed in the mission area. 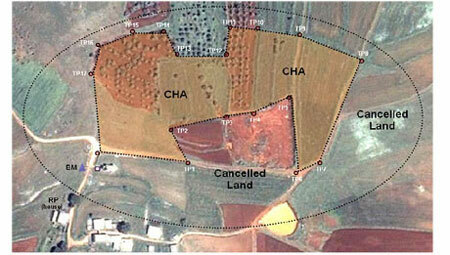 It is very useful and surely will help in the mission area like in Syria and other area with landmines problems. It is my desire and highly recommended to all peacekeepers planning to go on further study for their owned career advancement. " "This course is a real tool in the education of the risks related to explosives and especially the understanding of the organisation of the fight"
"ERW and landmine should be introduced into pre-deployment or induction caue"
"JE TROUVE CE COURS TRES COMPLET ET ILLUSTRATIF IL PEUT VALABLEMENT AIDER LES ACTEURS ET MIEUX CONTRIBUER A UNE PRÉVENTION AUX ENGINS EEI...MERCI POTI TOUS NOS ENCOURAGEMENTS"
"It is preparatory for PK mission." "basic concept of the mine and other explosive cleared by this course." "It helph me to undrrstand"
"I THINK PHOTO SHOULD BE PLACED IN CERTIFICATES....."
"J'ai aimé tout le cours surtout la partie éducation aux risques. Cependant sur le certificat je vois apparaître le titre/grade ce qui n'est pas normal." "The so interesting and also need it for the future"
"In this course I recomended it Good in matter that, It provided me with guidance in SOP. I rate it as 4 Stars, Good and motivate. " "first and foremost the course was free and available this helped me to acquire this knowledge that perhaps i could have not attained. secondly the presentation was so good and understandable, the concepts and all details were clearly explained and this made stronger my previous knowledge i had attained before"
"Great, one of the most interesting and useful courses that I have developed with POTI. " "the way how materials were described"
"Very good study material, lots of info, the only thing that makes me some troubles it wasn't in my language so it took me more time to finish the course, But fortunately I got it on the first try"
"This Course is very Informative, Educative and Enlighten as well. Mostly with the help of this Course i now know the Difference Between IED,UXOs, and all the Various Mines as well. Best Regard Awala Samuel." 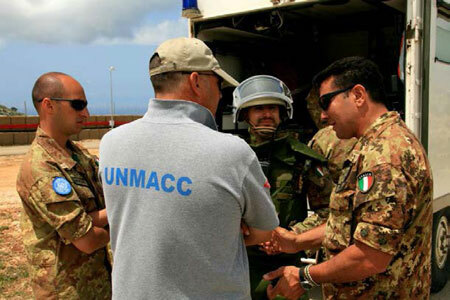 "This Course is a good entry in the case of demining"
"excellent course and very useful"
"A very comprehensive course, imparting very valuable knowledge regarding Mine Action and Explosive Hazard Management, which these days is being faced by more than 50 war stricken countries. " "el material es oportuno y aplicable a la vida real." "i am very happy to come across this course as a security personnel." "Connaissance d'un domaine humanitaire complètement nouveau"
"the basic safety knowledge encountering UXO/Landmine on how to avoid accident and mitigate by reporting suspicious items specially in area where armed conflicts occured." "Un cours très intéressant mais qui vous laisse sur votre faim. Il faudra prévoir des supports vidéo sur le déminage humanitaire sur le terrain. Ce cours peut être offert en présentiel en partenariat avec l’EMPABB de Bamako ou avec le CPADD (centre de perfectionnement aux actions post-conflictuelles de déminage et de dépollution) du Bénin." "Belle initiative d'aide à la sécurité des uns et des autres. Congratulations"
"Excellent course. The mine action course has exposed me to various forms of mine hazards that take place on the field and how to effectively deal with them ,as they pose a threat to humanity, most especially as the Boko haram insurgents are being dealt with in my country ,Nigeria." "The course is practical, applicable, well defined and scenario-based, enabling it to develop core competencies required by mine action service professionals and indeed all who are or could be affected by mine contamination." "Great course. Very informative, educative and to detail. A lot of research was put into place and this required a lot of reading." "The course was quite engaging and study materials were quite useful." "The IED component of the course is extremely helpful especially in recent times when there has been an increase in the number of IEDs or VBIEDs deployed in most conflict areas. I recommend this to every soldier or peacekeeper or a Civilian working in a conflict area. It adds to the knowledge base of individual soldiers or civilians who might have had the opportunity to have some training in MINES and UXO." "Excellent course, well presented, very enjoyable. good end of lesson Quizzes. " "VERY IMPORTANT LESSON TO ALL UN PERSONNEL"
"un cours complet et très interagissant "
"much information is known by the leaner and contains"
"This course captured the entirety of the mine action field from an informative perspective that ranged from technical issues, management issues through to legal issues. A very well balanced course that required understanding from me the candidate." "The course serves as basis of enlightenment for my field work in UN as a Military Observer"
"One of the best professional job, I love the course is full of explanation and warning"
"A course that should be taken into account when a volunteer moves into humanitarian aid for countries where the dangers of anti-personnel mines etc. are strongly present." "This is an excellent course, i really enjoy it as well as learning from it, I recommended this course as a grade A course because it is a nice and it makes you to have knowledge about how mines look like and how it look when laying on the ground, air or rock. it is an excellence course indeed. Thank you the Author." "Very comprehensive course, user friendly. " "It is a good course. 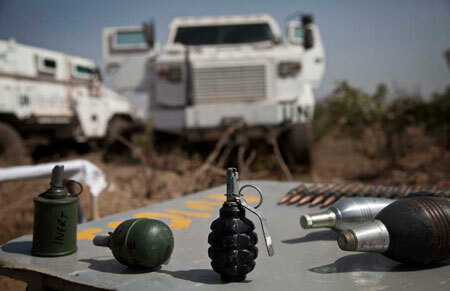 Basic information on mine action activities and awareness for danger related to mine ERW and IED." "PPT would be better to replace PDF." "Muy valioso el curso Lutte antimines et gestion des risques explosifs : impact humanitaire, aspects techniques et initiatives mondiales"
"Having previously worked in MRE, it was good to be able to refresh some information that was not current. 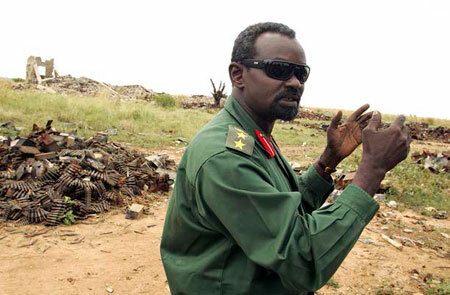 Additionally, one was able to catch up with more recent developments in Mine Action." "C'est un réel plaisir d'avoir étudier ce cours car il permet de savoir que ailleurs dans le monde, des milliers de personnes souffrent de l'utilisation abusive et mal-intentionnée des mines et autres engins similaires. Il permet aussi de savoir ce qui nous attend lorsque demain, nous seront envoyés comme missionnaire de la paix et ce que nous pouvons faire pour espérer revenir en vie, en santé et en un morceau complet à la maison... Merci à POTi..."
"J'ai beaucoup aimé la qualité et l'importance des actions de lutte antimines"
"very well balanced in terms of legal, political, and technical aspects of mine action"
"la proteccion especial y apoyo que se les da a las victimas de las minas antipersonal y los entes que los protejen"
"C'est un cours prurement pratique et tres intructif qui permet a l'etudiant de connaitre les aspects techniques et pratiques de lutte antimines." "Taking this course kept me on edge learning about dangers faced in mined areas as well as offering hope that the international community can alleviate the suffering of affected citizens." "A very good course,it help me to understand more about fire hazard, thanks my regard to everybody." "The course is very detailed and educative for those working in law enforcement." "The course was interesting and educative "
"Si porque el comflicto con las minas nos conpete a todos y asi sera mas facil dejar a un pais libre d esospechas de minas "
"5=EXCELENTE CURSO ME GUSTARÍA HACER OTROS CURSO "
"Hi, A very good update about the UN System Mechanisms and Policies for Mine Action and EHM. Also, there is a good method of study for how to proceed with the course, Many Thanks Gaby"
"The course is very informative and comprehensive, although, largely oriented on and aimed at pesonnel having immediate exposure to the mine management areas. I, being an Operations Support/Administrative Manager, wouldn't be successful in the course completion if not for my strong and lasting peace-building, peace-keeping and other relevant experience. Neverthless, I consider this course as extremely important in terms of broadening my knowleage in teh areas of mine action." "Very instructive training. Thank you for the work done." "Thanks to POTI team for these most valuable courses, learning materials etc. They really reflect both theory and practical. It`s now our turn to apply the knowledge and skills acquired. Mike Taban "
"The risk reduction tips are simple!Apply and you may save your life as well as that of colleagues." "The procedures and actions in the field when dealing with IEDS mines etc.."
"It was very nice to me." " law course should be included"
"Its a very comprehensive and and well structured course providing clear background to humanitarian demining and the efforts thereafter..."
"it really is a very important and valuable course to increase knowledge in peace operations , the course is well focused on the real situation and what you may face in complex situations. Excellent your guide"
"The scope is excellent. It is good for both military and civilians. " 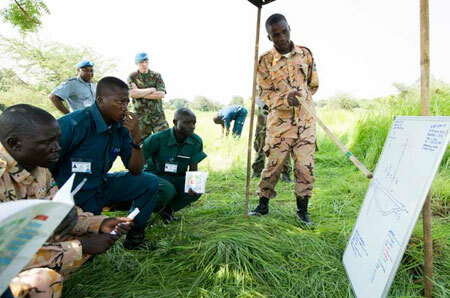 "IT IS A RECOMMENDABLE COURSE MOST ESPECIALLY TO MILITARY AND POLICE PERSONNEL"
"This course is a perfect guide for an increased public awareness on the global problem of landmines an ERW." "The course is useful "
"this course is valuable for the area contaminated with landmines"
"Course reading material only vital requirement to prepare for and pass the course"
"The general concepts and knowledge embedded in the course is very vital and has an impact in developing a peacekeeper who is aware about mine action,and explosive hazard management"
"I have enjoyed the interactive nature of the course. The book is very well presented." "It was an excellent course and very informative and highly recommended for new UNMAS employees or INGOs working in Mine Action. " "The course assisted me in my area of specialization "
"please dear colleagues try your effort to read this course because it is more than useful as you are or will work in conflict and higher crises areas this course is your life line "
"IT REMINDS EVERYBODY AND PROVIDES TEACHINGS ABOUT MINES AND PRECAUTIONS/STEPS TO TAKE WHEN COMING ACROSS ONE"
"I like all series and course titles"
"Excellent on the preventive measures against mines"
"The course is very important and relevant to all people who might work in a suspected or hazardous environment"
"THW COURSE IS VERY PRACTICAL AND INFORMATIVE. THE MOST OF IT ALL IS THAT IS DIRECT TO THE FACT AND THE NEEDED INFORMATION, WHICH MAKES YOU SEE IT AS A COMPRESSED COURSE WITH THE NEEDED INFORMATION"
"It was an informative course"
"Very educational course as it captures the wider arena of mine action activities. Most importantly policies, standards and protocols are clearly stipulated to familiarizing and informing. " "the course is very good and how we relay to those who did not access to internet. " "It was a fantastic course with so much valuable information"
"it was an amazing and educative course which expands my body of knowledge about UNO"
"What a good course that gives knowledge on mine action. It gives one the technical know-how in the detonation of bomb. very educative "
"This course helps to have a In depth knowledge about the history of mine action and explosive hazard management. 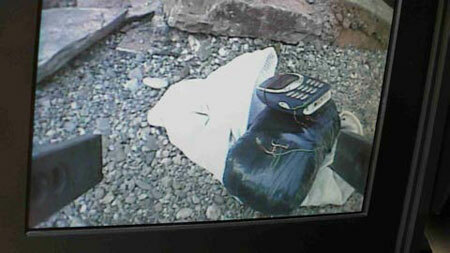 This also enables a person to save ones life while encountered in the mine /ERW incident." "The course gave me an insight on the effects of Landmines, UXOs, AXOs and IEDs and how they can disrupt lives of innocent civilians." 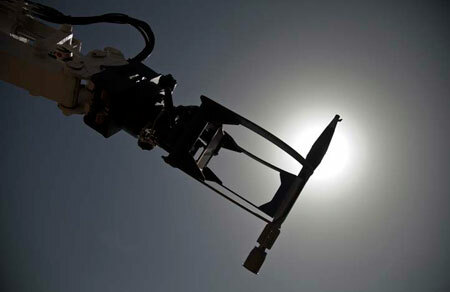 "The course is particularly useful for those joining or new to the humanitarian mine action sector"
"The chance to revise and refresh my memory on the humanitarian aspects of mine action, and to look more in depth at the principles." "It is very important and useful course"
"I really enjoyed this course,its very educative. In this course I learnt a lot of things I don't know about MINE such as safety in mine,identifying,victims assistance . Its a very good course I wish to do pratical aspecct of this course." "This course is very informative and detail orientated. A lot of time went into preparing this course and all UN staff, as well as other humanitarian aid workers can find benefit in completing this course." "The clarity and friendly nature of the course is a huge positive. Well Done!!!" "Gentlemen Dnt forget MIND, if you can remember MIND and follow it I think you are good"
"INTERNATIONAL MINE ACTION STANDARDS (IMAS) AND INTERNATIONAL AMMUNITION TECHNICAL GUIDELINES (IATG)"
"the course was very informative with clear examples." "In depth coverage of the subject matter was excellent. "